Use varying shapes, forms and colours of shrubs to provide your tropical garden with year-round interest. Tropical gardens are exciting palettes of colour, form and texture and your garden can be just as vibrant with a bit of planning. Because the tropical garden is not subject to the changing seasons and a slowing down of growth, as experienced in inland gardens, plants of differing structure and texture are as essential as flower colour to create year-round interest. Life is a garden if you grow it your way. Layered planting is frequently seen in tropical gardens where trees spread their high canopy of shade, and vines festoon the branches. The middle layer is made up of shrubs, while nearer the ground, ferns and ground covers grow in filtered light. Slender palms and indigenous Draceana hookeriana make excellent tall accent plants, and can also be planted in groups to give height, form and definition to the garden, and to shade understorey plantings. Golden aralia (Polyscias filicifolia), with large fern-like leaves of lime-green in shade, and golden yellow in sun, is ideal for narrow spaces because of its 3m upright growth habit. 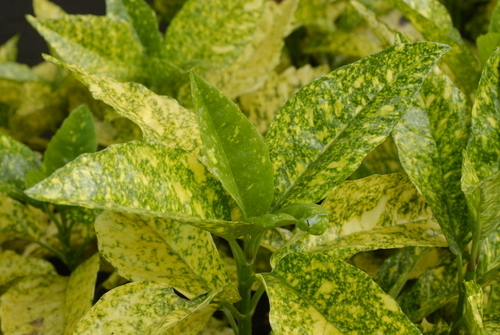 Additional height can be found in Pleomele ‘Song of India’ with gold and green variegated foliage, and P. ‘Song of Jamaica’, with two-tone green striped leaves. The strap leaves of dracaenas contrast well with the filigree foliage of tree ferns. Tree ferns, gentle giants of the forest, create delicate sunshine and shadow effects by day, and dramatic silhouettes where the garden is illuminated at night. The understorey consists of shrubs of varying height and spread that offer protection from wind, provide shelter for birds, and privacy. As well as exotic crotons and acalyphas with their colourful foliage, there are flowering shrubs, such as yesterday-today-and-tomorrow (brunsfelsia), the pink and red shuttlecock flowers of calliandra, and orange, yellow and buff coloured flowers of Cape honeysuckle (Tecoma capensis). 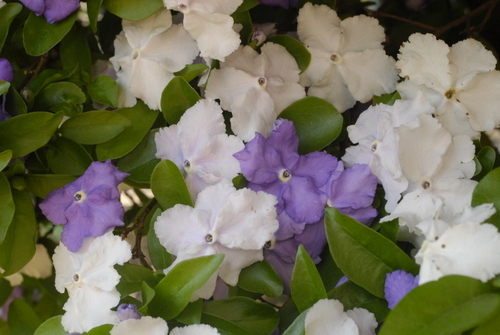 Shade-loving Mackaya bella has dark green leaves and dainty, bell-shaped, white-mauve striped flowers in spring, and Barleria obtusa forms a dense shrub and flowers in autumn. The 2m indigenous Croton pseudopulchellus is a beautiful and graceful small shrub with shiny green leaves, with the underside of the leaves a silvery-white with orange speckles. Colour in the tropical garden can also be used to achieve different effects – light colours giving a feeling of depth, with bolder colours appearing to advance. Hot pink, purple, violet, mango and orange are exotic, vibrant colours found in Strelitzia reginae, Tinnia barbata, Duranta ‘Sapphire Showers’ and hibiscus. Ixoras in shades of yellow, gold, carmine and pink, tangerine and red are wonderful value in the tropical garden and can be planted in full sun or dappled shade. 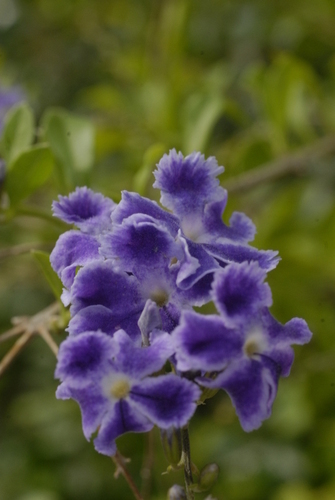 As well as flower colour, there are shrubs grown for their colourful foliage. The Portuguese laurel (aucuba) has green splashed yellow leaves and is ideal for shady parts. The maroon foliage of Phormium ‘Dusky Chief’ and Phormium ‘Shiraz’, and Cordyline ‘Red Fountain’ and Cordyline ‘Caruba Black’ are striking when grown near Duranta ‘Sheena’s Gold’. The twilight garden. In the cool of the evening, the white flowers of Hibiscus rosa-sinensis, Leonotis leonurus ‘Albiflora’, white hydrangea, Murraya exotica, the African dog rose (Xylotheca kraussiana), Freylinia tropica with small star-shaped flowers, Bauhinia natalensis with white bell-like flowers, Gardenia thunbergia and amantungulu (Carissa macrocarpa) will show up well in the twilight garden. Substitute indigenous tree ferns that are protected by law, with fast growing Australian tree ferns. 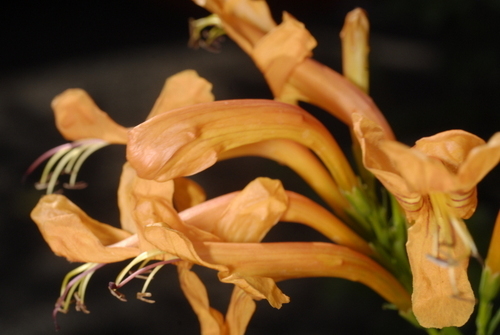 Control is important in the warm, humid conditions of a coastal garden. Use a high nitrogen fertiliser on foliage plants, and a general fertiliser on flowering plants. Flush out stagnant water in the centre of bromeliads to discourage mosquitoes from breeding. Add to the ambience of the garden by incorporating water in the form of a small pond, a fountain or a water feature, and pieces of driftwood sculptured by nature.